← What’s in a Unit? Here’s some more info on how the game works, this time it’s about combat. First, the basics. You hover the mouse pointer over the enemy unit and the game shows you the combat sheet. This shows you the likely outcome for the attack. 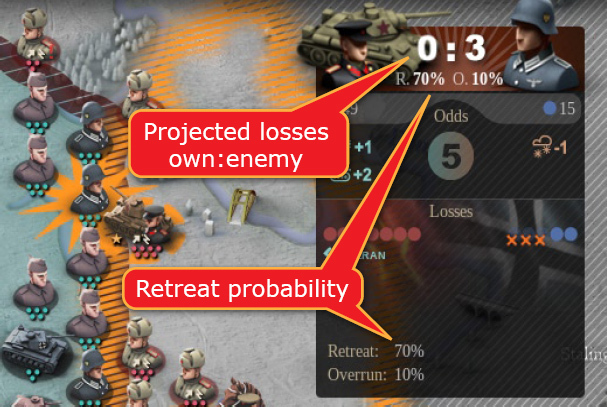 Obviously, you want to inflict maximum losses on the enemy but bear in mind that wiping out entire enemy formations in one turn is usually not realistic. A typical East Front strategy would be to pound until one of the defending units retreats, then exploit the gap in the line. The rest of the combat sheet is all about why the outcome is like that and you need to understand it to command effectively. The gory details are all in the manual. 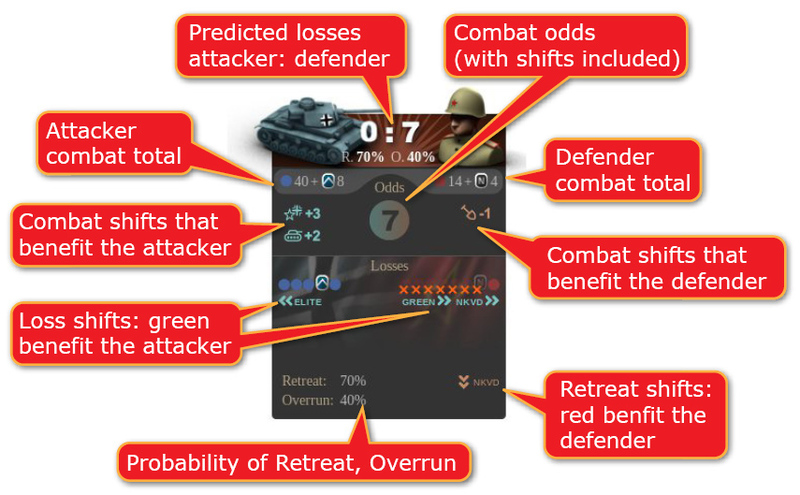 For now, let me just list the factors that affect combat outcome beyond the simple comparison of attack and defense values. Armor: armored units can produce a significant shock effect when attacking in suitable terrain. So, while the panzers are positively deadly in open terrain, they will give you no advantage when attacking across rivers or into cities, mountains, forests or swamps. Artillery: extensive artillery preparation prior to attack was widely practiced by the Soviets in particular. Again, terrain plays a role, but so does enemy entrenchment. Weather and Terrain: sometimes these effects are really pronounced. Conducting operations during the rasputitsa muddy season is near impossible. Cities provide good cover, and especially the ones ruined by bombardment. On the other hand, it’s actually easier to attack in swampy areas during the winter when they’re frozen over. Entrenchment: digging in helps, especially when there’s no favorable terrain you can use to anchor your defensive line. This effect can be negated if the attacker has engineers though, such as Pioniere specialist steps that the Germans have at their disposal in some scenarios. Experience: seasoned units fare much better on the battlefield than newly assembled ones and unit experience in UoC is a measure of that aspect of unit quality. Units can gain experience through attacking, but they can also lose some of it when taking reinforcements. I can’t fit everything into a single post obviously, so briefly: an overrun is when your attack succeeds overwhelmingly and you get to attack with the same unit again in the same turn. These are nice but you can’t count on them: the chance of overrun is never 100% in this game system. And the specialist steps can affect combact outcome in curious ways: here an NKVD blocking detachment is making the Soviet unit less likely to retreat but at the same time they take more losses precisely because. And that’s it for tonight. Hopefully this post was interesting enough to get you to sign up for the beta if you haven’t already. Ok, but can someone explain this “support” factor in plain words? I played a few games and don’t really get it – except that it seems vital.